Group has new Outreach program for Easter that once again proves that “Group” is spelled “E-A-S-Y”. 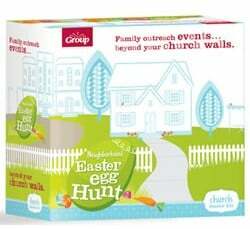 Churches enlist families to organize egg hunts in their own neighborhood, “becoming the arms and feet of the church”. The impact this could have on a community is endless, but, don’t underestimate what it could do for developing new leadership in the church! Families agree to host an Easter Egg hunt in their neighborhood, either in their backyard, local park or community building. After being trained, families are equipped to host an event that includes a craft, games, music, the egg hunt and a devotional, ending with an invite to visit church. It is recommended that all families try to host on the same day, either the Saturday before Palm Sunday or the day before Easter. The church leader kit includes everything needed to recruit families, enlist the church, and stir up the excitement. The guide prepares the director to host a fun-for-the-whole-family training rally. This isn’t a “meeting” but a hands on engaging “experience” through all elements of a neighborhood hunt following the same schedule as a neighborhood hunt so families can see everything modeled. Each family needs a Neighborhood Host kit to get them started on their own event. 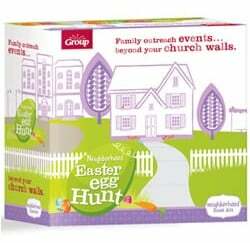 The kit includes the neighborhood Host Guide, neighborhood Easter Egg hunt CD, Invitations, Church Invitations, and Glow-In-the-Dark Gospel Wristbands for 12 kids. unfortunately, if you have more than 12 children attend you have to purchase an additional kit to get more wrist bands, as they are not available separately. A typical event starts with a warm welcome and a craft. Participants decorate a bag to hold the Easter eggs they gather. This makes it not only easy but gives room for creativity and flexibility. The games are simple, with minimal supplies that are easy to find. The snack ideas were very cute and fit the theme, but seemed a little involved; definitely something you would want to prepare in advance. The CD has the usual Group quality. I especially love that a few traditional Easter hymns are included and even some Group VBS favorites. After the egg hunt, the host family presents a devotional lesson to their guests. The lesson describes how sin “dirties” our lives and and how Jesus died to take away our sins and give us Heaven! Then, each participant is given a “wristband” to remember the lesson. Tony Kummer (Editor) reviewed & updated this page on : August 31, 2017 at 12:57 pm. All our content is peer reviewed by our readers, simply leave a comment on any post suggest an update.